Rediff.com » Movies » That's Irrfan, folks! Irrfan Khan is back in Mumbai, but has been keeping a low profile. The actor has apparently been continuing cancer treatment at the Kokilaben Dhirubhai Ambani Hospital and Medical Research Institute, north west Mumbai. Irrfan mostly travels with a mask on his face. 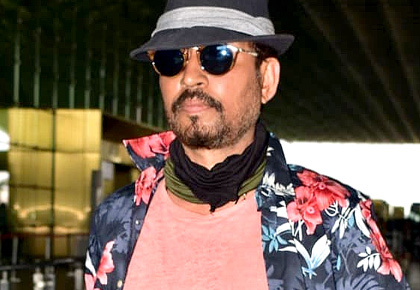 On Tuesday, April 2, Irrfan made an exception as he walked out of Mumbai airport with the mask on, but removed it and posed for photographers. 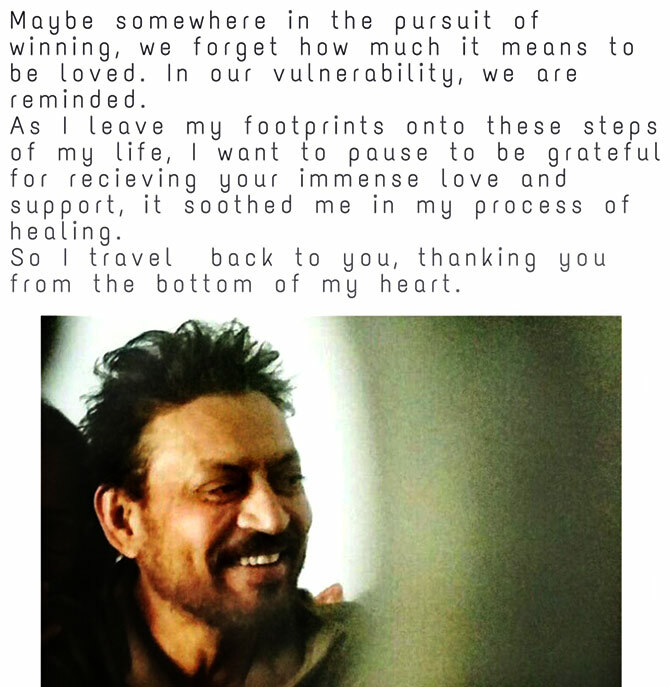 On Wednesday, April 3, Irrfan posted an emotional tweet, thanking fans for all the love and support they have given him in his fight against cancer. 'Maybe somewhere in the pursuit of winning we forget how much it means to be loved', Irrfan tweeted. 'In our vulnerability, we are reminded'. 'As I leave my footprints onto these steps of my life, I want to pause to be grateful for receiving your immense love and support, it soothed me in my process of healing. So I travel back to you, thanking you from the bottom of my heart', the wonderful actor added. Irrfan was diagnosed with a neuroendocrine tumour, a rare form of cancer.